Swallows swooped to and fro above as Pauline and I sat savouring tasty paella on the patio. 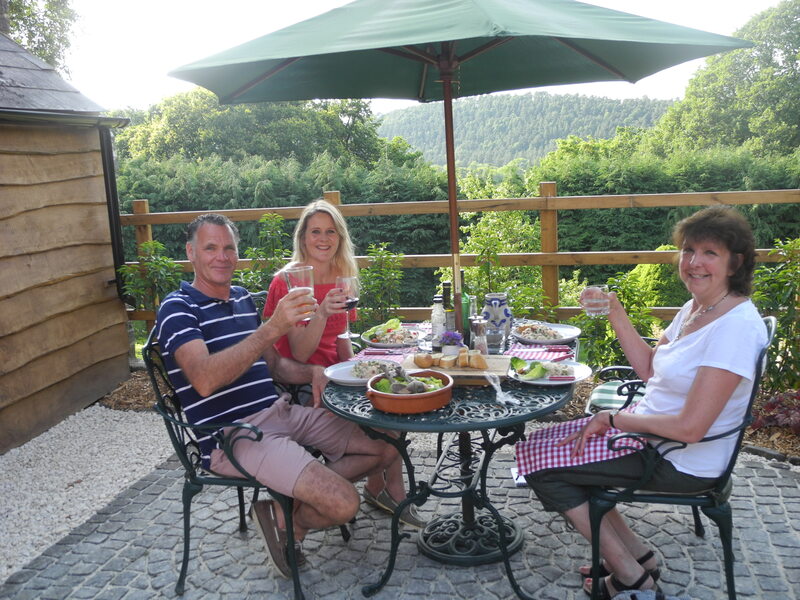 We were guests of Anthony and Amanda the latest owners of Little Warham Fishery nestled deep in the Torridge Valley near Beaford. 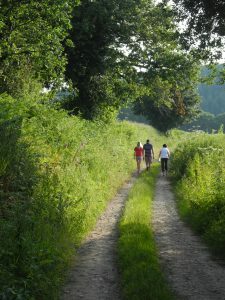 It was Midsummer Eve and birdsong resonated all around with pigeons cooing peacefully in the trees. 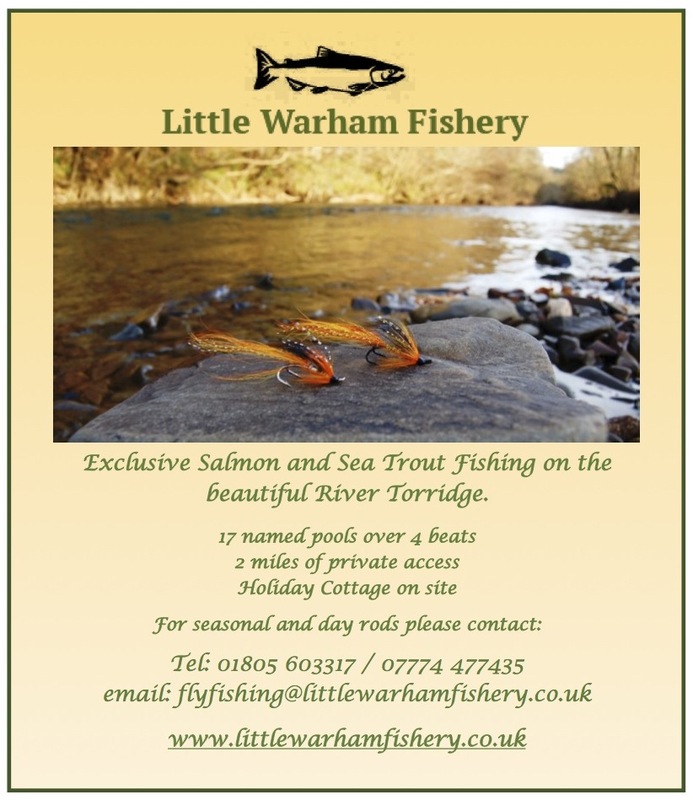 We had met with the new custodians of Little Warham back in the autumn at the Torridge Fishery Associations annual Dinner at the Half Moon Inn at Sheepwash. Summer seemed a long way off then with the leaves turning brown and the evenings growing longer. 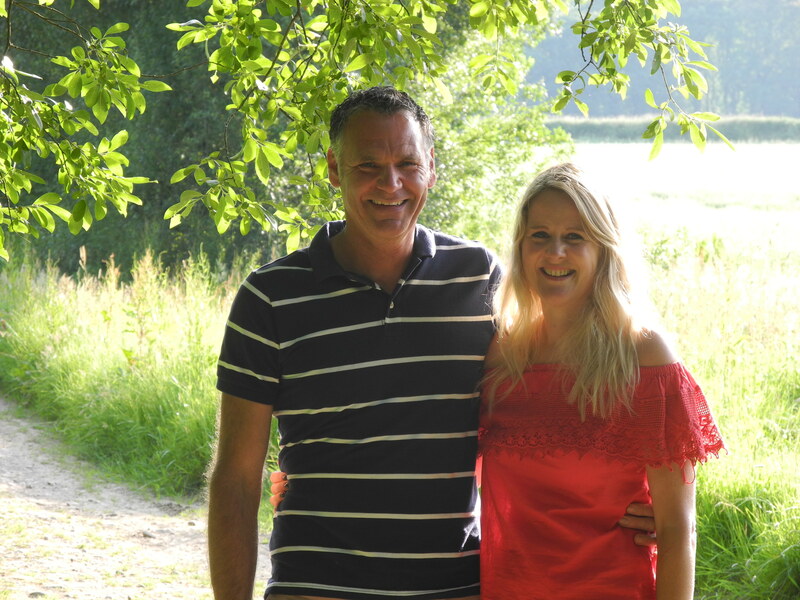 Anthony and Amanda had told us enthusiastically of their plans for the coming year and invited us to join them at some point for a look around the fishery. Those eight months had certainly flown past, as life seems to these days. The old Farmhouse has a timeless air about it and glimpses of its history linger. Anthony showed us the larder in which the salmon were stored after being collected from the river by horse and cart. An ancient dark wood smoker stood beneath a fine copper beech tree. 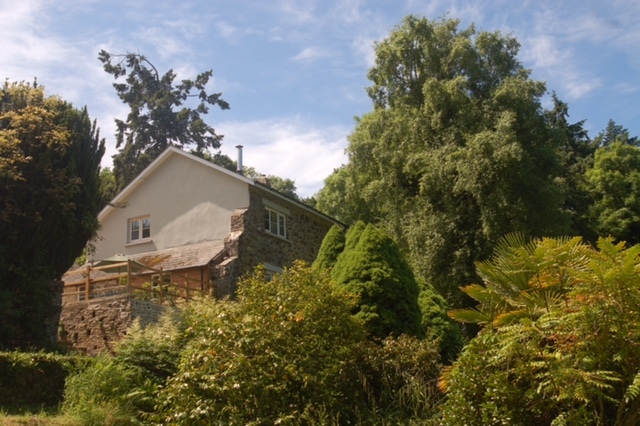 The house is thought to date back to around 1790 and was for many years a fishing lodge undoubtedly visited by many salmon anglers in far off days when I guess it was predominantly the gentry who would cast their lines. 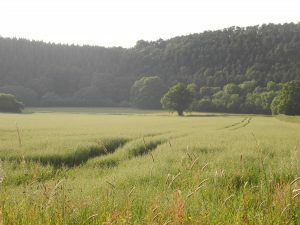 We talked of fish, of fishing and life before setting off to the river down a delightful path that lead to fields of wheat and oats that stretched before us to the river that was hidden from view by a row of trees that were in their resplendent peak of lush green. Summer flowers lined the hedgerows. The yellow flowers of spring having now given way to pink fox gloves and dog roses of summer. The scents of summer drifted in the air. 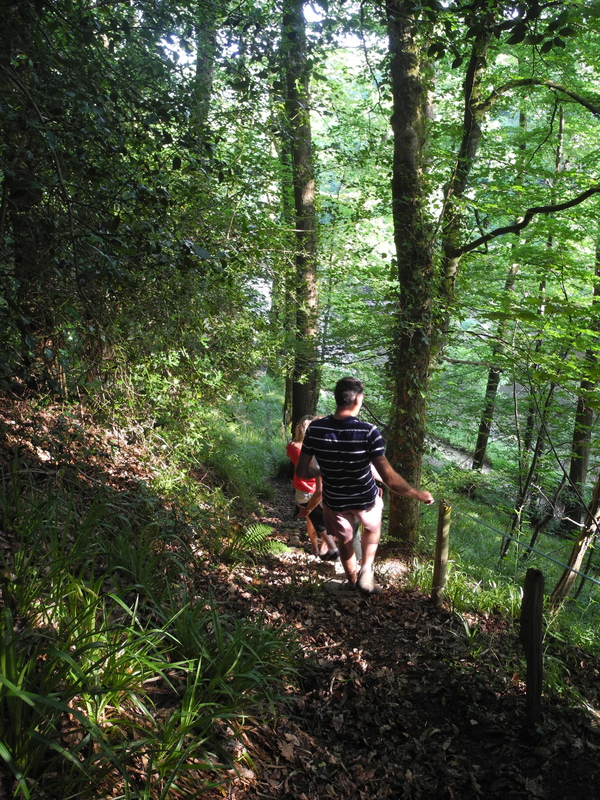 We came to a path leading down a steep slope towards the river that could be glimpsed through the trees. As we reached the valleys base the damp musty smell of the river filled the nostrils. The famous fishing hut stood here the heart of the fishery and place of peace, contemplation and I am sure the focus point of many enduring friendships. 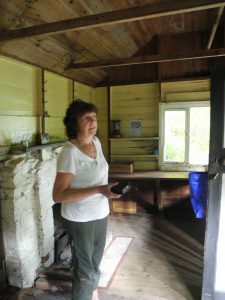 I was passed the key and carefully opened the door of the hut stepping inside to a hut full of memories. The smell of wood-smoke hung in the air. 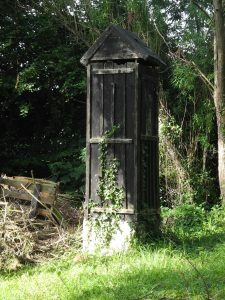 An old gaff hook hung upon the wall and cheap white plastic chairs contrasted starkly with the historic feel of the hut. Anthony lifted the trap door that concealed the cool recess where salmon were stored until the days end. On the fireplace sat an old black and white photo within a frame. 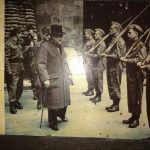 Winston Churchill stood inspecting a row of military personal, one of which was Group Captain Peter Norton Smith the late husband of Theresa Norton Smith who had resided at Little Warham since the mid 1960’s when they had moved to Devon following a long distinguished military career that culminated when he was appointed CBE. 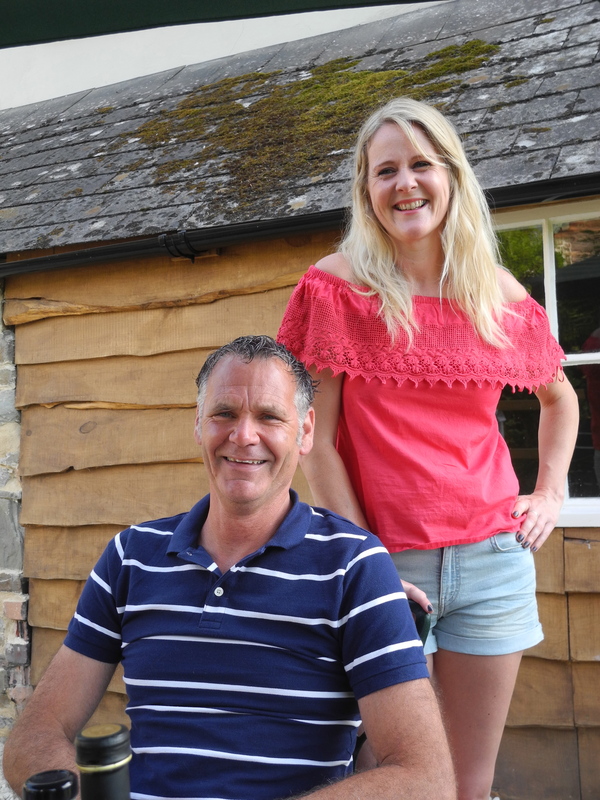 Captain Peter Norton Smith and his wife were instrumental in helping to rejuvenate the River Torridge that was at that time heavily polluted by farm effluent. Norton Smith was Chairman of the Torridge Fishery Association a post later held be his wife. A hair wing salmon fly was created in his honour and the Norton Smiths were also the subject of a poem, “Torridge Salmon” by Ted Hughes. 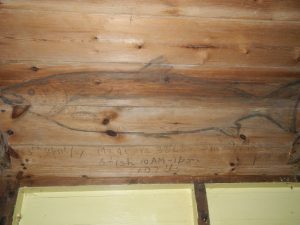 Carved into the roof of the hut is the outline of a huge salmon weighing 32lb one of six magnificent salmon landed on April 10th 1932. The six fish totalled 106lb and were landed between 10.00 am and 1.00pm. A fact that reminds me of a conversation I once had with Charles Inniss who told me that the best time to catch a salmon is when you have just caught one. 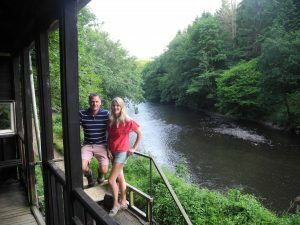 After lingering for a while within the atmospheric fishing hut it was time to wander downstream to view the river and some of its 17 named pools divided between four beats. 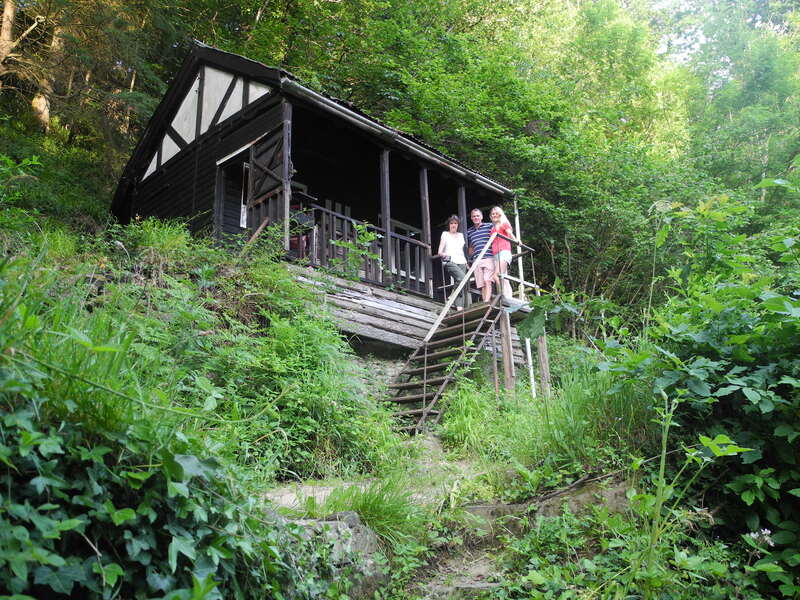 Guests fishing the river traditionally swap beats half way through the day after breaking for lunch in the fishing hut. The river was at low summer level and showing its bones. Despite this I knew there would be salmon and sea trout hidden within the deeper pots and expected to see a splash and a glimpse of silver at any moment. This enchanting stretch of river meanders with a mixture of slower pools, glides and rapids. The far bank descends steeply to the river and is densely populated with pine trees. The right bank we walked upon is populated with sycamore, withy, ash and majestic oak trees. 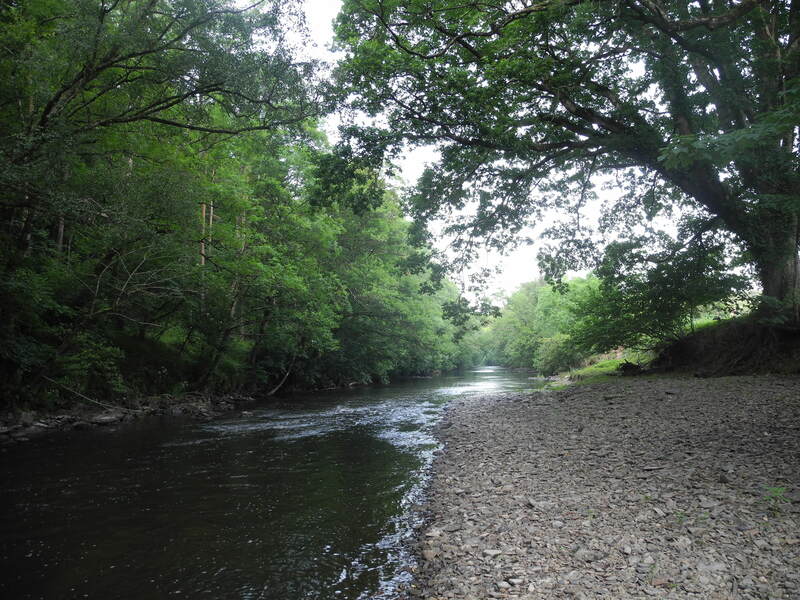 Anthony informed me that the oaks were planted beside the river so that they could be felled and timber floated downstream to the boat builders at Appledore. Amanda talked of walking the riverbank during the spring and of the snowdrops, wild daffodils, primrose, bluebells and wood sorrel that had preceded our visit. 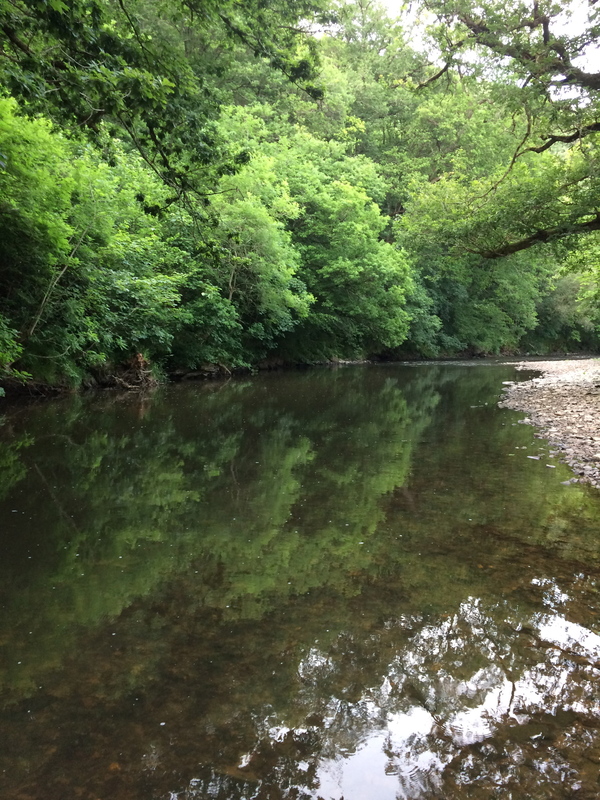 One of the joys of walking a river is reading the water and guessing where the rivers fish will be stationed. The occasional trout rose as flies drifted down, we saw a mayfly drifting slowly in the surface film and wondered how long it would be before it was devoured by a hungry trout. As we strolled we caught site of the flash of electric blue as kingfishers darted above the water. The whole valley had a timeless ambience undoubtedly enhanced by a lack of intrusion from road or rail. 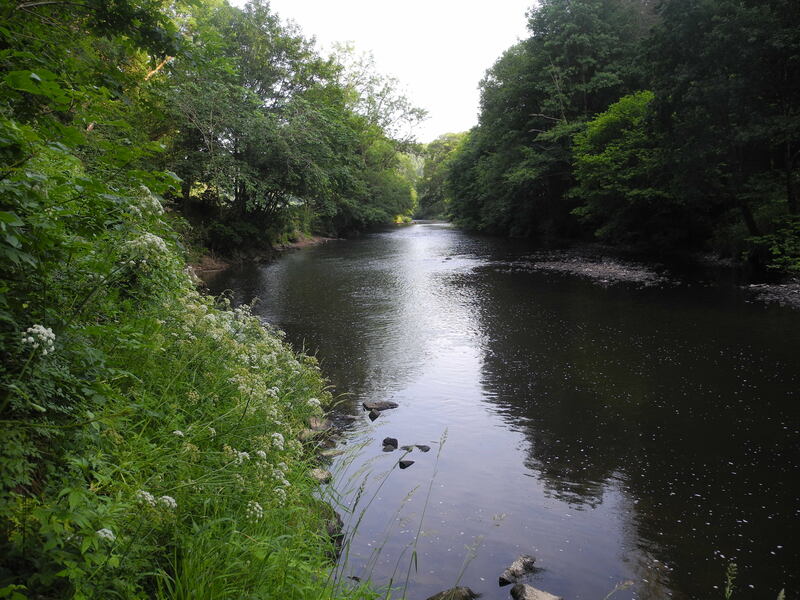 The Torridge unlike the Taw has long stretches of river that are far from such transport links ensuring it remains silent except for sounds of nature and occasional rumbling thrum of a farm tractor. Our walk was interrupted at one point by the discovery of a sheep that had become trapped upon its back beside the river. Anthony quickly scurried down the steep bank and helped the poor creature to its feet. It staggered drunkenly for a few yards and then trotted out into meadow free to continue its simple life. The fishery retains its character no manicured banks here just a few well-placed lengths of rope to aid access to the pools. 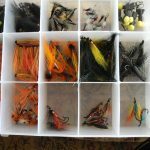 Anglers have wondered its banks for many decades and little has changed accept perhaps the fish populations that are undoubtedly just a shadow of what they were in those halcyon days of old. 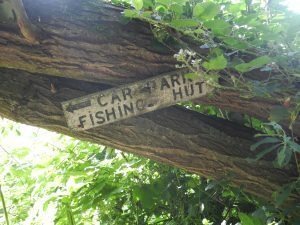 It is sobering to think of those Victorian anglers loading horse and cart to take their days catch to the salmon larder at the house. 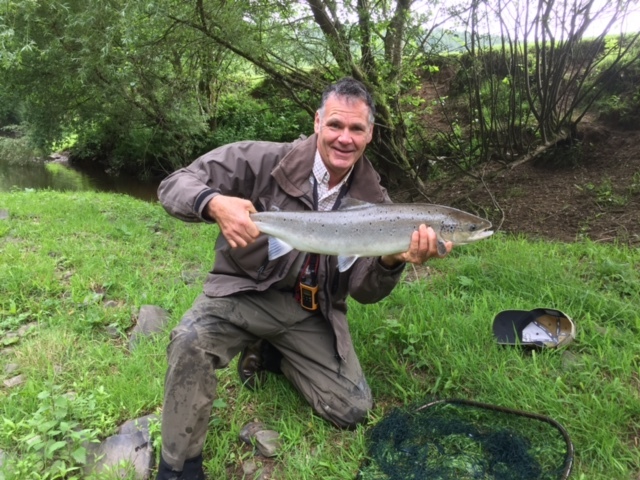 I look forward to returning once again to the river when a recent spate has brought in a fresh run of salmon, descendants of those fish angled for many years ago. I will undoubtedly be able to put the flies I purchased during the visit. For they carry a selection of flies tied by those detained at HMS Prison in Exeter. 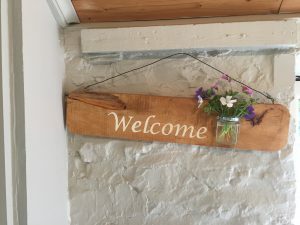 After reluctantly leaving the river we were taken into the recently refurbished holiday cottage that will make a wonderful base for both anglers and lovers of deepest rural Devon. 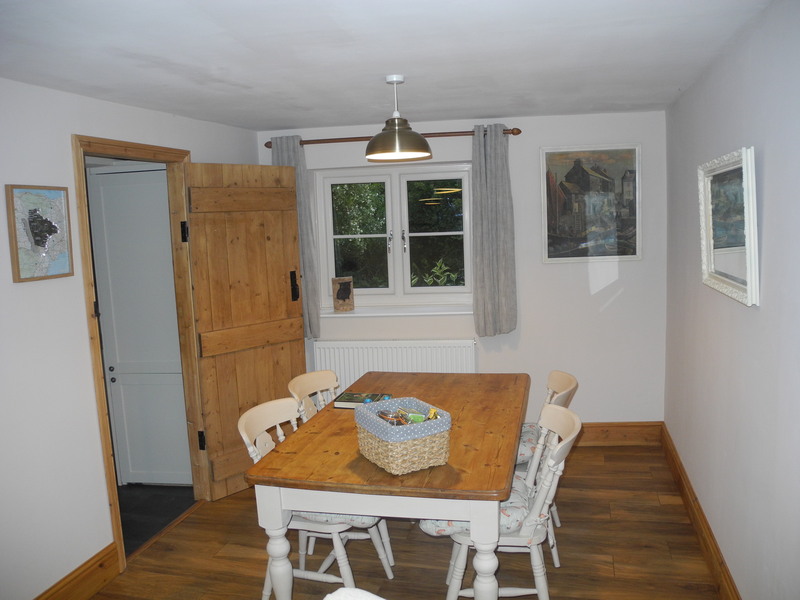 The cottage is furnished to a high standard with Amanda’s artistic touches evident throughout. 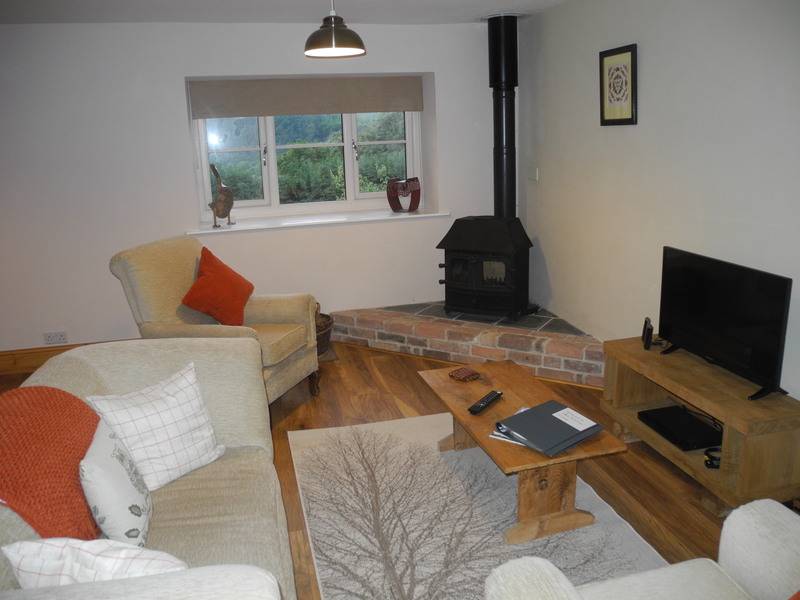 A wood-burner ensures that the cottage will be warm and cozy during autumn and winter when the valley is decorated with a crispy layer of frost, autumn leaves flutter to the ground and the salmons journey culminates as they spawn in the river of their birth. I have tried to paint a picture of the river valley but when I returned home that night I thumbed through the pages of a book in my collection. “ A Summer on the Test” by J.W. Hills.